WOWZA!! This month has flown by!! Where did summer go? I've been adjusting to some changes in life lately so my posts have been a little sporadic. I'm hoping I can figure out how to juggle it all. This week at iSPy, you are in for a treat!!! We are featuring Karen Dunbrook ( k dunbrook @ SCS) and is based on this card. Karen is the queen of CAS!!! If you check out her blog or SCS gallery, you'll need to grab a cup of coffee and a cloth because you'll be drooling over her fantastic work!!! I love the simplicity of this sketch. And if I do say so myself, I really like how my card turned out. I used some Carta Bella DP as my inspiration and used the MFT set called "My Favorite Sentiments" (this was part of their birthday releaes). 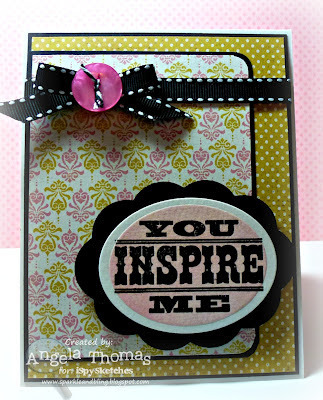 I stamped the sentiment in Versafine Onyx Black and then embossed it with clear embossing powder before sponging with Pink Pirouette ink. 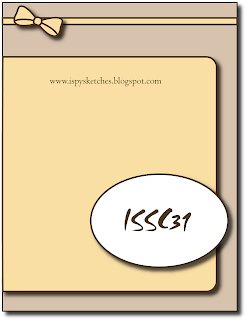 Create a paper crafting project (card, scrap book page or 3D item), based on the sketch provided.Post your creation on your blog or an online gallery (using a code ISSC31), and link it here with the inlinkz widget below. Please provide a direct link to your post - not the generic link to your blog. A new challenge will be posted every Friday at 12:01 AM EST, and you have until noon on the following Friday EST to submit your entry. You may enter as many times as you like, but please provide a newly designed project with a new link for each additional project. We will choose the top 2 creations to be featured in our "Top 2 Winners" post every Sunday where we will announce who we have picked :) The winners will receive their very own iSpy Sketches blog badge! Have fun and we look forward to "spying" your creations! Love the bold black accent on this card.